I have fled. I’m sorry, I just need to go for a while to try a few things out…. but I’ll be back…I promise. Dear Institution is a presentation in the form of a love letter addressed to an anonymous academic institution. It light-heartedly describes a love/hate relationship between arts practice and academia from the personal perspective of a practice-based PhD student who flirts with both. At times I love your borders and framework but I also need some time out to explore my artistic capabilities in a different context. I won’t forget you. You are always in my heart. During 2012, Rebecca Louise Collins, undertook part of her research at apass (Advanced Performance and Scenography Studies) in Brussels – a “non-academic” environment for artistic investigation. In a letter she wrote (but never posted) she outlines not only the struggles and frustrations of being an artist in academia but also the pleasures and challenges to be found in articulating and developing a practice within the higher education system. I never said there was anything wrong with you. I’d just like to see some other people too. It’s not you it’s me. What does it mean to be an artist working within an academic framework? How can alternative sites of knowledge be recognized and valued without the need for ‘justification’? These are key concerns that emerge along with questions as to what forms of ‘collaboration’ are possible – how can we work both together and alone? The italics in bold indicate instructions to perform the reading of the presentation. Move to sit on the table at the front of the auditorium, take out a phallic ornament from your pocket – a small statue of a building or a castle – or straighten out the microphone. Fumble for the letter in your bag using the microphone to track the sound. I’d say it all began about 10 years ago during my first degree in Drama and English literature at Queen Mary University of London, that was where we first courted, exchanged our first glances and intimate moments. Just the other day, I came across a reminder of one of our first encounters, On Performance Writing featured in Tim Etchells’ book, Certain Fragments (Etchells 1999), do you remember it? There is that part about radio porridge, you know, the idea of a voice that is made up of fragments, layers and scraps – a voice that creates more of a “space” that is inhabited, a space through which stuff flows with bits that get lodged inside. With this in mind, my beloved, and without you thinking you have ever left my heart for one moment, I’d like you to close your eyes and concentrate on my voice. I’m writing this letter, composed of scraps and fragments, roughly outlining some of the difficulties you and I both know we have been having lately. It’s going to get quite personal, and be from my particular perspective, but I don’t want you to take it personally. Recently, as you know, we spent three months apart. I went to Brussels, to apass – advanced performance and scenography studies, a non-academic research environment based on principles of self-education and collaboration, a kind of “open collective” that encourages sharing and developing knowledge together (See www.apass.be ). I didn’t want to leave you, but I felt like I had to after many months of reading, writing, and researching in a small, lonely cupboard-like office. I had to take action. During my time in Brussels I developed a practice situated between theatre, performance, sound art and audio installation. Taking the word “audience” in its etymological context as “the place of listening” and the performer as the place of speech, I wanted to challenge this relationship and make abstract this somewhat dichotomous relationship to ask whether the voice alone can create the space of theatre. By isolating a relationship of listening and speaking, I sought to question what might be in the voice that is beyond words and how we might relate to each other through the voice if normal conversational situations are estranged. While there and since then, I have been reflecting on our relationship; at times there are things which I do or which actually happen that I feel unable to explain in words and I know you prefer us to communicate in writing, hence this letter. I don’t want to justify myself to you but I think it is something we should discuss further. At times, I sense things or feel things in my body or around me that I don’t know how to tell you about, the minute I try to explain it I feel it becomes less interesting or looses some of its significance. I also have a small confession, I’ve started to see some other people as a way to try and share some of these feelings in person and make sense of it all. I know it’s painful but here I’d like to go through some of these feelings in a bit more detail. I hope you understand. It’s not you. It’s me. I like the fact that you are always pushing me and I know that that is part of our attraction (wink), but at times I wonder how far you are willing to go to understand me and how best I can show you what I know. At some point, I felt like you no longer understood me, you had become controlling and demanding, nothing I did was right. I became paranoid. You had become obsessed with frameworks, methodology; all these over blown words and concepts clouded your vision of me. I began to mouth the words I thought you wanted to hear yet whatever I said wasn’t good enough for you. (Mouth these) Ontology, phenomenology, semiotics, post structuralism, aesthetics, dialogical aesthetics, relational aesthetics. You began to make me sick. Our ways of knowing each other seem endless, we are continually caught up in a process of getting to know one another and I want to remind you as Annette Arlander (wink to Annette) also did that “knowledge is a matter of doing” (cited in Arlander 2009, 78.). With this in mind my love, I left you. I locked my office on the third floor, packed my suitcase and boarded the Eurostar for Brussels. (Whispering) At times the space between me and you is many thousands of miles, train journeys and car journeys, hours of waiting in queues in airports, rubbing shoulders with strangers, breathing in airplanes with so many of the same people, breathing in and out, creating our germs together in the same space. Adjust your own mask before helping others, before helping children; the exit closest to you may be behind you. Don’t forget to look behind you. (Faster pace) I was pulsating with the rhythm of the city, the clunk and chink of the heating pipes, the people on the street giggling, laughing, snippets of conversations heard, signs of life crossing over each other. Apass – a place with flexible walls, willing to continually question and challenge the role and relation of the institution to those within it. No hierarchy. Self-organisation. Other sites of knowledge production, the YouTube clip held alongside the theoretical text. 24-hour access to a studio space. A store cupboard. My work there began thinking of how to revert the logic of sound in space instead of working with sound as space; I wanted to move away from the logic of audio tours (your other darlings Janet Cardiff, Lavinia Greenlaw) and digitally mediatised sound. The objective was to move away from the voice as used in many post dramatic performances (Forced Entertainment, Need Company, need I name more?) to consider the voice in its live format as found in earlier, more basic technologies. I was inspired by early 19th century hearing devices and speaking tubes such as those used on ships and sometimes now found in playgrounds. I wanted to consider the voice itself as space, the voice as an object that takes up actual space in the world, in an attempt to make it more present, less ephemeral, to really feel it as spit, breath, warmth, to smell it. I have to confess, darling, that I began by attempting to find a solution to the questions we had posed together – a conceptual approach to the work but it just wasn’t working, I was so keen to get my hands dirty. I had to challenge my assumptions, forget the conceptual ideas and begin on an exploration that would find its way as it went. I gave myself up to, “the matter of thought in hand”, instead of following a clearer method as that might have suggested I had already determined “how to proceed” (Beardsworth cited in Freeman 2010, 4). I gave myself up to intuition and worked on that, following what Robin Nelson terms as “know-how” (Nelson 2011, 107.). I let something else take over that led me to take decisions and follow those. (Whispering) The journey includes dead birds, a badger, a red kite on the way in the road. The odd stray beagle and an adventurous lamb. Stalactites and stalagmites of ice, there are frozen toilets and non-24 hour garages. The space between me and you is endless and infinite at times. I began to work as a craftswoman understanding from a makers perspective how the surface of different found materials might interact with the voice and the consequences this might have on the conversations that could take place within a built structure that complicated everyday dialogues. At apass I had open access to a large store cupboard full of neglected objects and materials that began to influence the work and process. I invited others to ‘play’ with me in the studio making a series of ‘sonorous dens’ – small spaces were constructed within the studio from found materials and abandoned objects that altered the perception of the sound of our own voices and the sound of the voice to those outside of the den. Through these experiments, I learnt that the kind of speech you use and how you situate yourself in relation to another person is altered if you do not see them nor see where they are situated in the space. Furthermore, by putting the voice into contact with different material surfaces such as plastic, foam, and an old duvet – the body at times horizontal, at other times seated, mobile, restricted – the imaginary landscape of what you might say or how you might engage your voice alters. With other senses restricted, the voice becomes the only instrument to orientate yourself and your relation to others in the space. Of course, as you know “nobody works in a vacuum” (Nelson 2011, 114), the work was developed within a theoretical perspective, held at the back of my mind all the time were the words of Adriana Cavarero, the uniqueness of each persons voice, her rejection of Western metaphysics to consider what is in the voice that is beyond words that makes each of us unique (Cavarero 2005). Outside of the meaning of words what other elements tie us all to one another in reciprocal communication? How might breath, rhythm, pitch, intonation, resonance affect our sense of Being? The theoretical approaches were held alongside, bubbling in the background, as I embraced “not knowing” and a child-like curiosity, a playful approach combining both free play and rule-based play (Caillois and Barash 2001.). However, the practical exploration gathered speed of its own accord leaving me still trying to catch up with it and make sense of its lingering resonances and echoes. And you were gone, you were never here, but your voice at least gave me some indication of your presence far away in the distance. 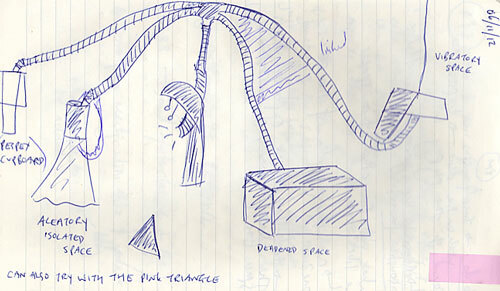 From the crafting of a series of “sonorous dens”, four spaces each with specific acoustic properties were chosen. The practice then progressed to look for a way to connect the spaces that had been made in order to channel the voice from one constructed space to another without allowing sound to bleed into other spaces. It was important to join the voice yet maintain the body separate, to share a soundscape but not a physical space. After several trials with distinct materials, yoghurt pot telephones, 1960’s intercom devices, plastic tubing was decided on – the kind usually used to hide electricity cables underground. These connected the separate spaces that enabled voices to be channelled from one space to the next, not only the voice but also the breath, moisture from the breath and its smell of coffee, alcohol, and cigarettes. (Whispers) The space between you and me at times is endless, infinite. Until we breath in the same space, until we share the same air, swop germs close enough to spit at one another, but we don’t. We are close enough to feel each other’s presence, feel the presence of the other in front of us, in touching distance. With the connecting structure in place, the next phase of the investigation could begin. I invited others into the “sonorous den” spaces to explore and discover how their voice could connect with each other’s through the tube structure – using words and at times, only sound. The voices all gathered in one central outlet but could also be heard through the end of each tube. Harmonies, fragments of text, whispers, giggles and cries of help generated in separate constructed spaces were collected together. At this stage, my love, I am reflecting on the encounters that others had with the work to bring out the enquiry. Reflection on this is what allows me to tease out what would otherwise be perhaps too obscure or difficult to pin down to something material and exact. Through this structure and through the articulation of the encounters with the structure it manifests itself in ways that I am still struggling to articulate to you, be patient sweetheart. In reflecting on what didn’t work, the slight dead endings and wrong turnings I took or have taken, I begin to see the path I intended to take more clearly. Where I might have taken a detour, I feel my body go numb and cold, my fingers paralyzed over the keys on my MacBook pro. Like a game of hide and seek, I know in my heart of hearts when this is on the right tracks – you, my silent partner in crime, nodding quietly in the background. Yet I struggle, as it is the written format that is still the most accepted form to turn tacit knowledge into explicit knowledge (Nelson 2011.). A landscape of sounds expresses something that is difficult to put into words; there is a lack of vocabulary to describe the shades and tones inherent in the voice, in multiple voices. Particularly when the something that you are describing is abstract to some extent. I must admit, I began to miss you and your ways however rigid at times; at least I know where I stand. I hope you don’t feel as though I have betrayed you. Whilst in Brussels I was able to share some of my feelings and working process with others. I realised that an important part of my practice is to invite others into the process to work with me. It is a kind of collaboration – we would work through a set of questions or exercises that fed into the work. It seems difficult, if not impossible to work alone and something I don’t understand is this tendency to be and feel isolated, the return of the artist to the ivory tower – it seems as though you want me all to yourself, complete exclusivity, but I want you to understand, I need to put my work into dialogue with others. My time in Brussels allowed me to put my work into contact with a network of others. It seems to me like this is an essential element of our relationship if we are to continue, otherwise I fear that I will become out of contact and out of context. However, I must say, it wasn’t all so idyllic, on that week the third week from the end – everybody became truly sad. A boy on the fourth floor would cry and wail at night, even an Alsatian dog on the corner of Rue Dansaert had tears in its eyes. There was no reason for this sadness except for a slight inkling of disillusion and burst bubbles that the community that had been expected and hoped for was not actually there. Now all hope of finding it, or of it materialising had diminished, almost completely. That was the seed of all the sadness that engulfed the city, that in fact not all of the voices could be heard. The secondary waves of an echo of hope crushed those at the outset; muffled voices, fake coughs and spoof illnesses prevented them from being together. Was it that they just didn’t exist? Some traces were always left lying around – a mouldy coffee cup and that persistent blue leather jacket too small for anyone’s body that had walked through the door. I remember our early days darling as though it were a honeymoon period, we were in the studio, the library, in the backstage area, on the tube – we went everywhere. Lately it seems you want to keep me locked up, chained to my little desk on the third floor of the library. You want me to lead with my head, not my heart; from the waist down I am paralysed. Things are going to be different now my love, I’m back with a better idea of what I need from you and how to get it. We’re going to work through this together. (Whispers) Our words my love and beyond them, its in our breath, in a rose-tinted breath that’s how I know and how you know that we are in love. The between of me and you, its not quite me, not quite you nor us but almost. At some points we join and at others we move away. Like the particles of quantum physics – small particles of me mix with small particles of you and as I leave they disperse in the air, defibrillate, dilate, but I don’t deny they are there or that they exist. Just because we don’t always see them, that doesn’t mean we should stop looking my love. In my heart now and later on too (I hope). 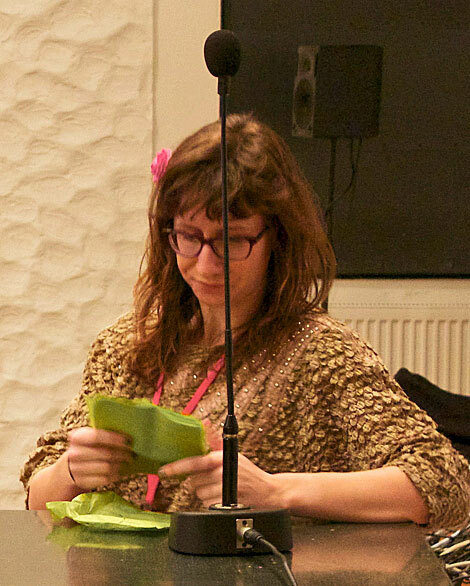 Rebecca Louise Collins is currently undertaking a PhD at Aberystwyth University investigating listening, the voice and speech as theatrical modes of being. Her artistic work varies between the live and audio-based. She is driven by a curiosity of how an audience accesses and engages with a performance experimenting with structures of participation and how presence and energy alter what occurs in the “now” moment. Her work has been shown in the UK, Germany, Spain and Brussels. Her research has also been disseminated in a peer-reviewed journal. Freeman, John. 2010. Blood, sweat & theory. Oxfordshire: Libri Pub. Nelson, Robin. 2011. “Practice-as-research and the Problem of Knowledge.” Performance Research 11 (4). pp. 105–116.